The one and only time I've met and spoken to Paul is something I'll never forget! I'd seen him several times at various places but never spoken to him, but in 1971 when he had the party for Wings, I decided to go along to the Empire Ballroom armed with camera and a large shopping bag which I always carried around with me at the time. Anyway I arrived at 8 pm and found I had just missed him by about 2 minutes. I decided to wait. I just had a feeling that I'd get to speak to him. 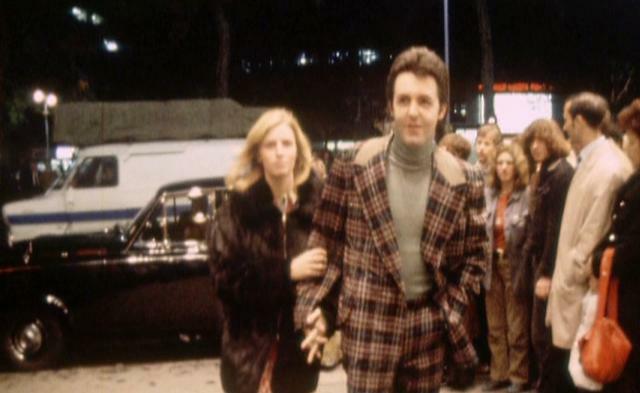 Well, after waiting five hours, the doorman whispered to me that Paul was on his way out; then he appeared with Linda on his arm. I thought how handsome he was close-to, a bit smaller and slimmer than I realized. Linda was much prettier than her photos. Anyway, I took a photo (of his jaw-line as it happens because he turned his rotten head away!) and as that was the last exposure in my camera, I couldn't take anymore. He went skipping (yes it is true) down the road with Linda and just as he turned the corner to a side street, I took courage and called him back. He stopped and said "yeah" so I ran to catch him up and breathlessly asked him for his autograph. The funny part is my pen as at the bottom of this large bag of mine! He stood patiently watching me with arm folded as I rummaged elbow deep. I asked him if he had a pen as I just couldn't find mine; he said no (which isn't surprising as he had this crazy suit on that had no pockets). By then loads of people had appeared but Paul still waited patiently until I emerged which I thought was really nice of him. 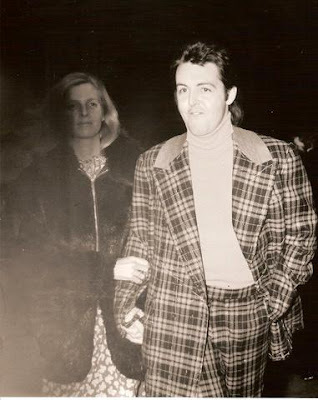 Linda was very smirky when a fellow said to Paul "No more Beatles then Paul?" and before eh could answer Linda leaned across me and smirked "No, no more Beatles." Paul then waved to all and said "OK love" when I thanked him for stopping. He disappeared into the night and I stumbled, shaking into a taxi! Paul is smaller & thinner in person than he appears in pics; being 5'7" myself it surprised me that he didn't seem to be much taller than me when I first met him in person - maybe those cuban heels tricked us so long ago!